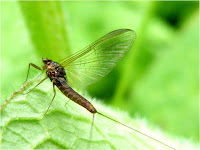 Although mayfly nymphs can live under the water for a number of years, I always feel a little sorry for adult mayflies as they don’t have a digestive system and therefore cannot eat, which means they usually die within a day of becoming an adult. So on one hand I feel bad about wasting their precious time by trying to get a decent photo of them, but on the other, I feel that they’ve been immortalised beyond their one day on dry land. 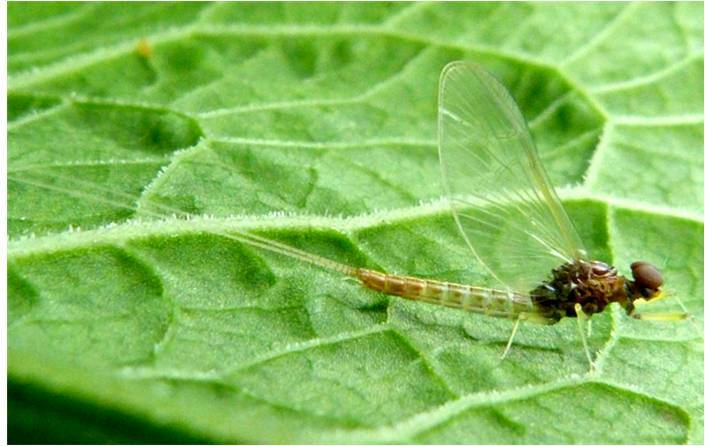 Mayflies often appear to have a curved abdomen and have two or three distinctive long “tails” known as cerci. They also often have these large upward-looking eyes. 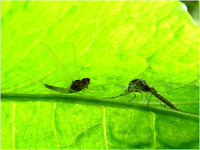 Mayflies are unique among insects as they are the only insect that have two adult phases. The sub-adult that emerges from the water has dull, opaque wings and is known as the ‘dun’. 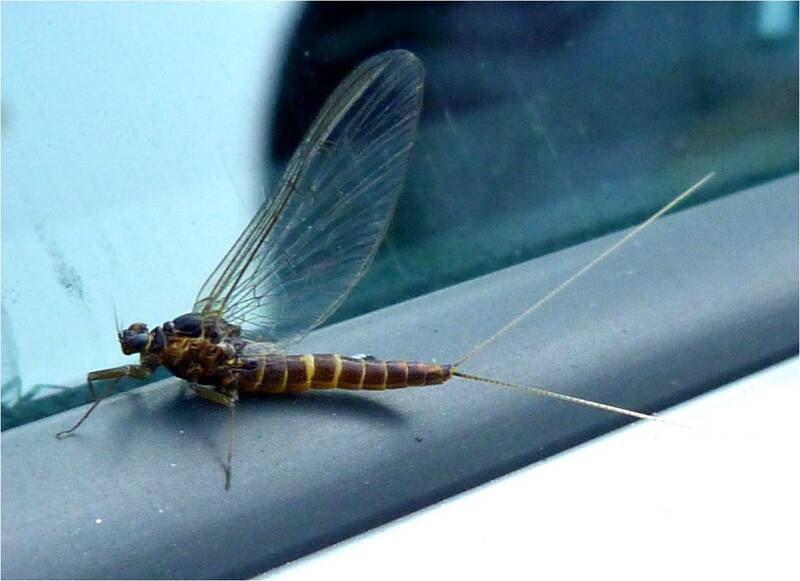 Fly fishing anglers construct their flies to look like dun mayflies and mimic their emergence from the water. Once they have emerged from the water, duns fly to vegetation to hide and shed their skin and become mature adults known as spinners with longer tails and translucent wings. 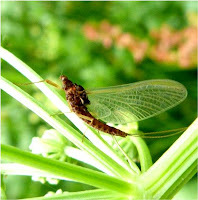 As outlined above, it is usually possible to tell which phase of adulthood a mayfly has reached by the colour of its wings. First phase adult mayflies have opaque wings (photo on the left) whilst the second phase adult has clear wings as pictured here in the photo on the right. 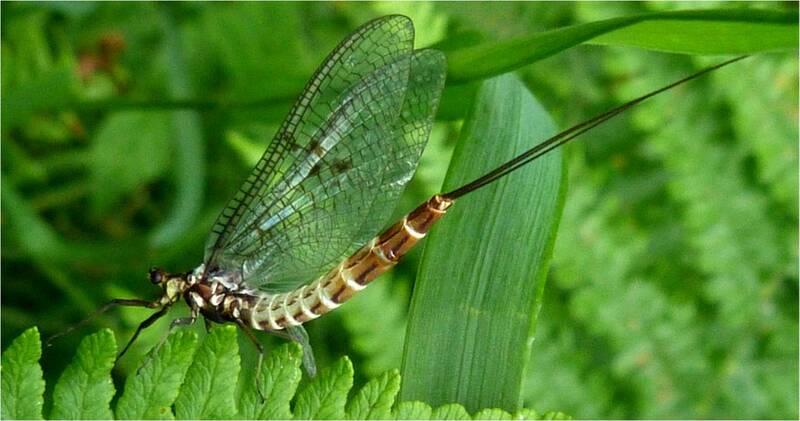 It can be difficult to identify certain species of mayfly apart and a microscope may be required. This species has two ‘tails’ known as cerci. It looks to me as if the dun (first stage adult) is on the left and the spinner (second stage adult) on the right. I’ve inverted the photo on the right so that it is easier to see the mayfly, which explains why the flowers are upside down! This is known by anglers as the blue-winged olive. You can see the wings on the dun are more obviously tinged blue, and they have the typical reddish-brown body, large circular eyes of the male and the three cerci (tails). Apparently anglers are not in fact terribly interested in these mayflies as they crawl in moss and hide under stones and so are difficult for trout to find. 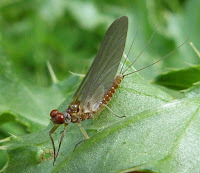 I think this is a spinner rather than a dun as the wings are clear and the body is a deep brown colour whereas the dun is an olive/light brown colour. 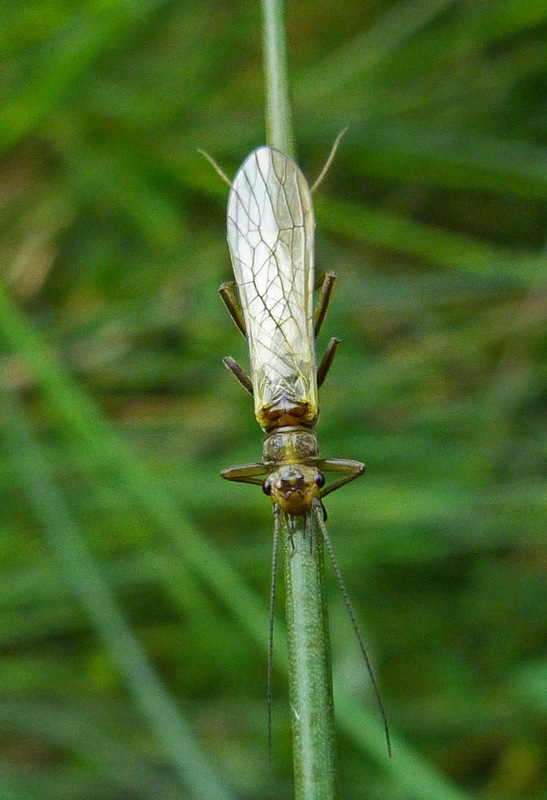 The obvious features with this mayfly are the yellow bands around its abdomen and the two cream coloured cerci. 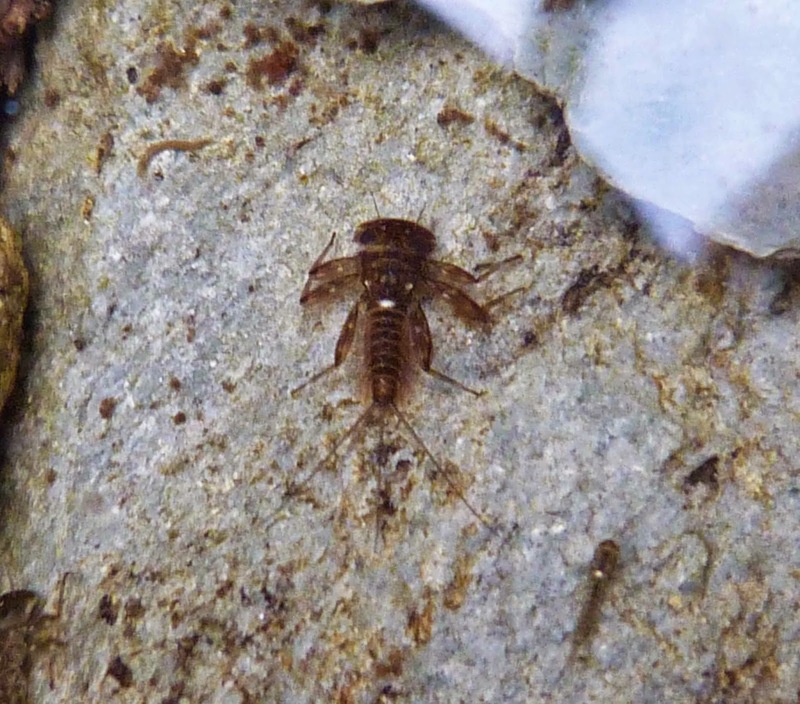 This is one of the earliest mayflies to emerge. An absolutely stunning, large mayfly with large spotted wings, a creamy abdomen which becomes brown toward the tip and three long cerci. I confess to fining this one twitching in a pond and lifting it onto this fern. Once a female has mated, it flies upstream, lays many eggs into the water, then dies - which is perhaps what this one had just done. Anyway, this photo has been inverted, so it was obviously alive enough to be able to cling on to this leaf. 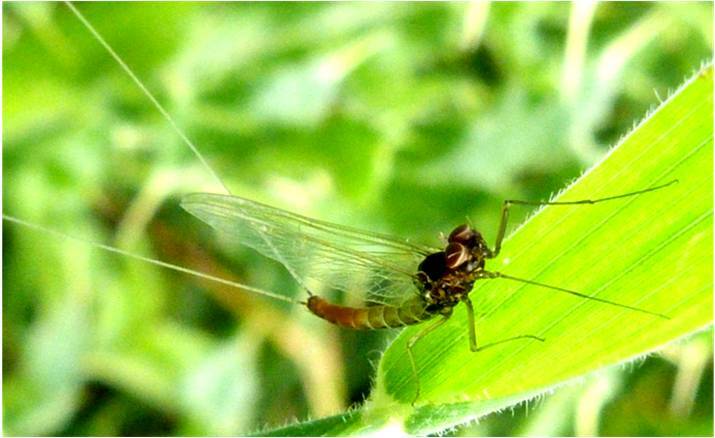 Like most mayflies, this one was found beside a lake, or a loch in this case. These can be black, brown or yellow insects and their membranous wings are either folded flat over the body at rest or else are wrapped around it. It is fairly impossible to tell them apart. 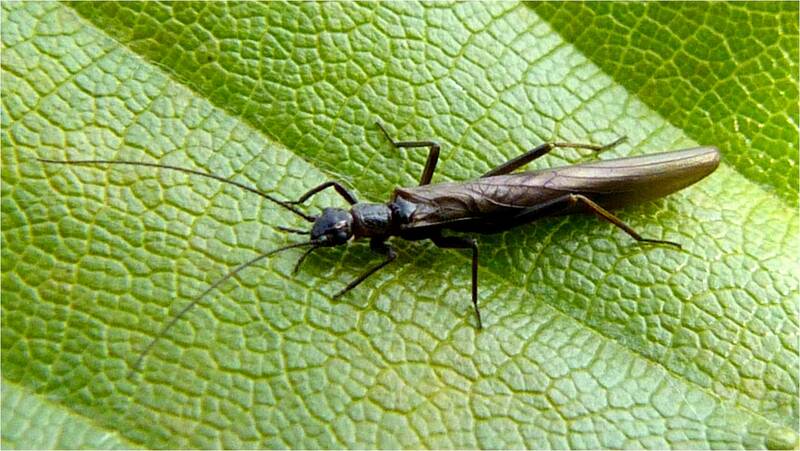 Stoneflies sometimes have ‘tails’ like mayflies, known as cerci (see stonefly below). They are usually found close to water. 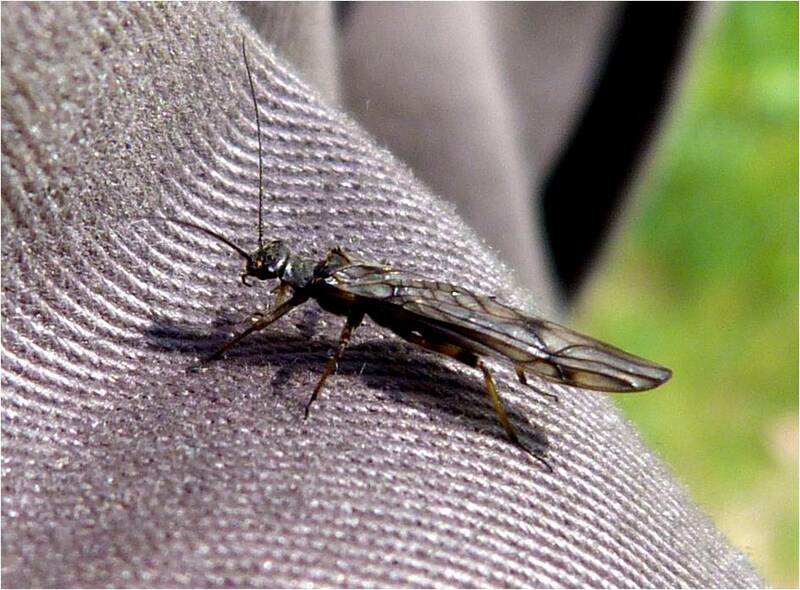 Anglers call this the large yellow sally and if you look it up on the internet, you get lots of helpful fly fishing advice on how to make your fishing hook look like this stonefly and very little to nothing on the insect itself. 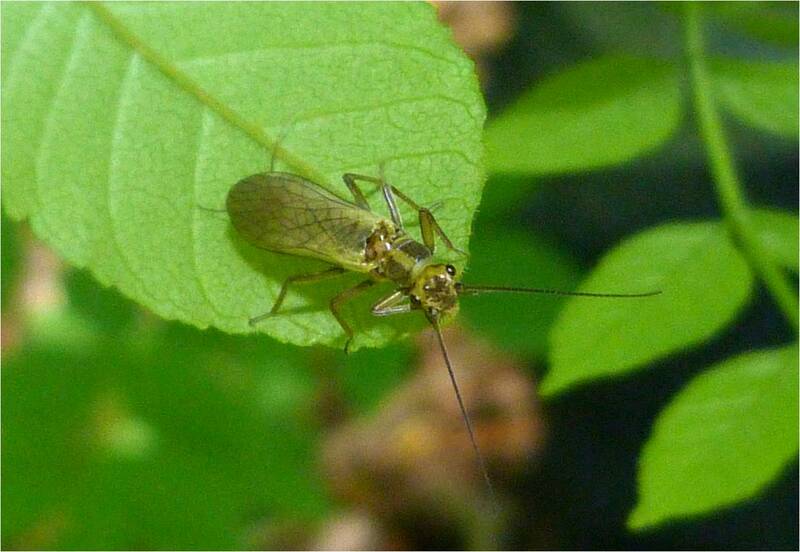 It is apparently the only large yellow stonefly in Britain although there is a similar smaller and narrower stonefly, Chloroperla torrentium. Apologies though for the quality of this photo - the thing would not stop moving so unfortunately there is hardly any detail, but the wing veins are supposed to have two ladder-like structures on them. It is also a fairly large insect which is longer than it appears from this camera angle, but you can just make out the two relatively short cerci (or 'tails') at the end of its abdomen.